My co-worker and friend Jennifer won't claim to be a "chef" or a "cook"... but I think she's quite good as both! She's made many accomplishments over the past year including losing over 60 lbs. by changing her diet and exercising. I am very, very proud of her! One thing she has learned in the past year is how to cook more things from scratch. I think now she secretly enjoys spending time in the kitchen! She recently shared this super easy and delicious recipe with me and I had to brag on her. It's too delicious and simple to keep all to myself. Jennifer's family is 100% pure Italian. She grew up eating Italian for breakfast, lunch, and dinner every day. Pasta, pasta, pasta, and a huge vat of spaghetti/tomato sauce were always in the kitchen. Since Jennifer has followed Weight Watchers to learn about portion control, healthy foods, and how to eat for good health, she's learned new ways to make recipes. Her recipe for an easy marinara sauce is simple, delicious, and packed with real Italian flavor. 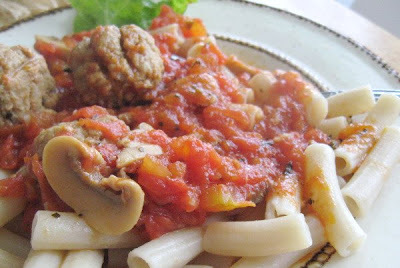 Jennifer said that the best tomatoes to use for this sauce are imported from Italy and have a natural sweetness that really makes the sauce special. In a medium sized saucepan heat oil to sizzling. Add garlic and onions and saute until golden. Pour in can of tomatoes with liquid. As tomatoes heat through, take a potato masher and crush tomotoes until they are the consistancy you desire for a sauce. I prefer them chunky and thick. If you want your sauce more smooth you could certainly use an immersion blender or add the sauce to your counter blender and blend until smooth. Simmer sauce for 30 minutes or more before serving. This is also great in the crock pot for an all day simmer. Just in case you were wondering about those meatballs in the picture above... here is my go-to recipe for gluten free meatballs!! I generally use Tinkyada pasta or spaghetti squash for my "spaghetti and meatballs" base. Mix all ingredients in a large bowl, and roll into shape with hands into about 15-20 medium sized meatballs. Place in a greased glass baking dish and bake for 20 minutes. Add baked meatballs to heated sauce of your choice and serve over glutenfree pasta or spaghetti squash. My husband and I are in Florida for the week, so forgive me for not adding printer-friendly PDF's of these recipes! I will add them as soon as we return home! Pray for good weather, as we will hopefullly be watching the the launching of the Space Shuttle Endeavour at 5:40am Wednesday morning!! Impressive on the weight lost! I need to get there, too. Ugh. I love pasta, and it loves my hips. Perhaps I should stay away from this dish! But I bet it would be good on a baked potato, too. Hi Abby! Don't forget you can use good ol' roasted spaghetti squash as your "carb" base even though it is very low in carbohydrates, it tastes very similar to pasta in texture (at least i think it does!) I always keep a spaghetti squash at home to roast just for when I need a quick naturally gluten free, low carb "pasta!" Yum!! Thanks for commenting gal!! I always appreciate your visits!! Boy I need to get to Weight Watchers! :) That really looks good. My family doesn't like the chunks of tomatoes, though I do. I bet it tastes terrific! A good marinara is one of those homey things, don't you think? This sounds like a delicious, simple recipe. Beautiful, simple marinara! Thanks so much to your friend, Jennifer, for sharing the recipe and please tell her awesome job on the weight loss! What a simple, yummy recipe. It sounds like it's completely fresh and delicious. I love that you added herbs de provence to your meatballs. I'm going to have to try that. I use it in lots of things, my favorite being oven roasted chicken. Amanda -- Thank you so much for your comment!! I need to get to WW too! My friend Jennifer has done REALLY well with their program! I'm so proud of her! Mrs. W -- Thanks chica! I always look forward to your comments!! I love simple recipes! My favorites! Hi Shirley -- Thanks for stopping by! I will tell Jennifer congrats for you! I can't wait to try some of your recipes! Veggie -- thanks!! Unfortunately it was cancelled both times we tried to see it! We were so disappointed!! Oh well! !